There comes a time we all need emergency sub plans for kindergarten. 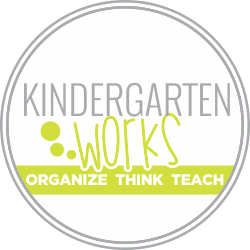 Here are free beginning of the year emergency sub plans for kindergarten that you can prep in advance. You can stash your plans, papers and read aloud all together and sleep better knowing if you have to call it in, you’re all set. 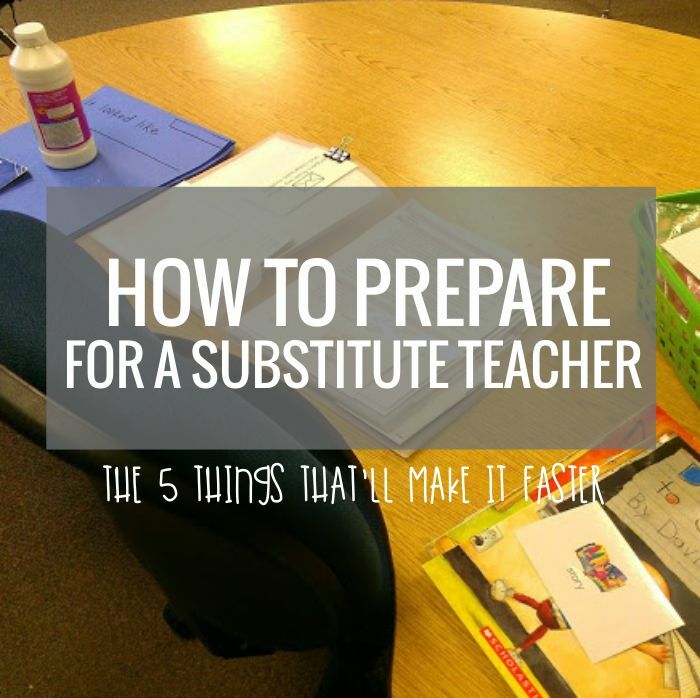 If you like being prepared for a sub in advance you’ll love my substitute survival and thrive-al pack. Let’s make being in a sub’s shoes a little easier, if possible. Now, if you’re planning emergency sub plans for k – you’ll need something for reading, math, writing and probably a time filling project. Let’s see if we can’t cover all of the bases, shall we? 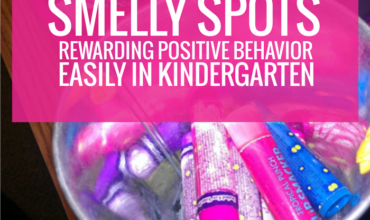 A note about what I’ve dug up for you… I loathe worksheets. Seriously. So, I made these emergency substitute plans as I would for my own class – with some interactive elements and a few supplies. You should totally have everything in your classroom though even if you have little time to prep! Print my directions (below) so you can easily plug and play the things you want your sub to do. Then click on the items made by other people that I’ve linked to in this post and print them. It’s the beginning of the kindergarten year and your kiddos are pretty new to this whole school thing. Let’s make your sub’s day the easiest we can by planning a themed day. 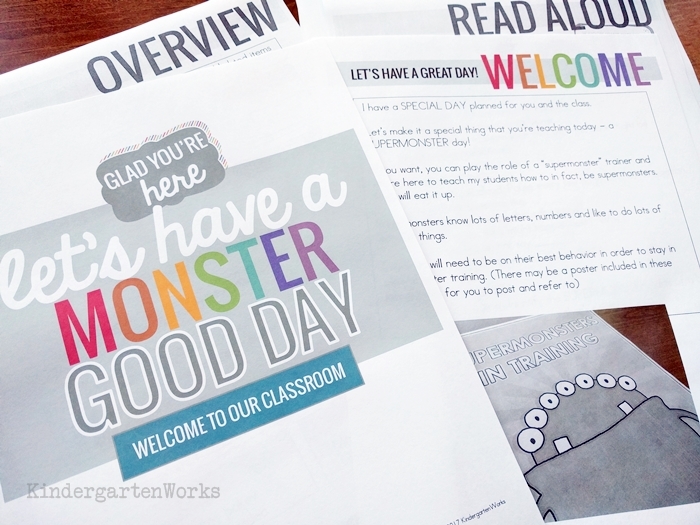 Let’s make a monster themed day for your beginning of the year emergency sub plans for kindergarten. 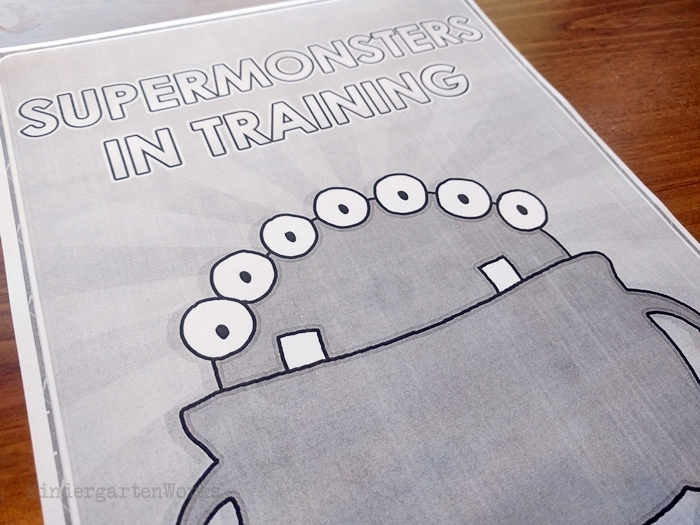 Today’s goal: training to become supermonsters! Can you think of a monster-related book you (or your teaching neighbor) have? Grab it! Some ideas to jog your memory (these are affiliate links to books on Amazon) or you can raid your school’s library to find these or any similar monster-y book if you’re planning ahead. No matter what book you pick, I’ve pretty much got the directions for it in the free download. An alternative – or a bonus time filler – let Grover read The Monster At the End of This Book aloud to your class in this video. It’s a sweet story where Grover pleads with the audience to stop reading and turning pages since he’s afraid of monsters. Only to find out he’s the monster at the end of the book. If you pick more than one book, put each set into a ziploc baggie so the sub can easily grab the ones you want them to read. Note which ones on your sub plans you want each group to use. 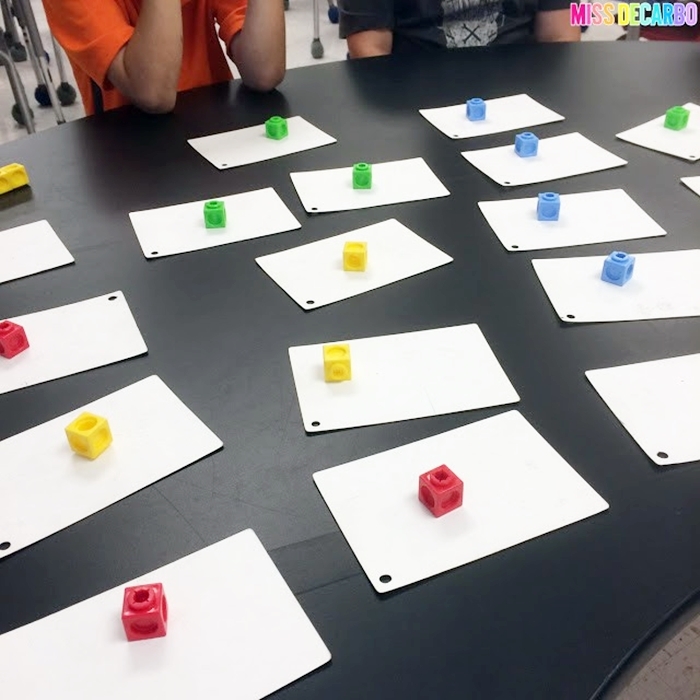 If you’d rather go in a different direction, then print a set of sight words or alphabet cards and play this quick recognition game in small reading groups. I’ve made a set of each to use on the fly in your download too. If you want your sub to do letter sounds instead of naming the letters with a group (or groups), be sure to note that in your sub plans. Alright, let’s plan for math. 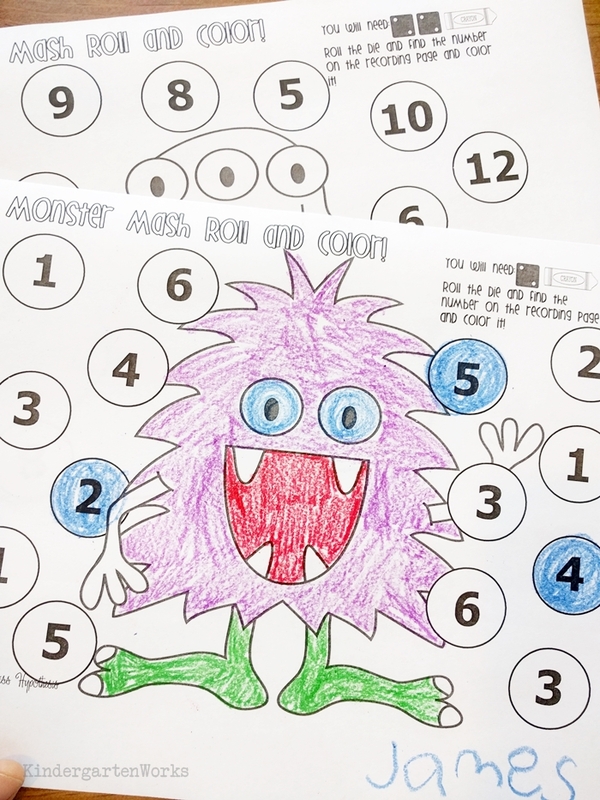 If you can scrawl a note to your sub to let them know where your class set of dice are, then you could use these free monster roll and color worksheets. It’s basic numeral recognition and counting practice. You can decide on one dice or two and click print. If you’d rather skip the dice, then these I Spy Numbers 0-10 free worksheets are what you want to print off. Give your kiddos a few breaks during the day. Here are some ideas to plug and play. Get your kiddos up and moving with a fun monster hokey pokey song. Instead of putting your hands in – you put in your claws, big hairy feet, fangs, and more. I’ve included the lyrics in the download for your sub. Or show this monster shuffle brain break video. It’s just shy of 5 minutes long and will get them on their feet. Kick off writing time with monster writing pages. 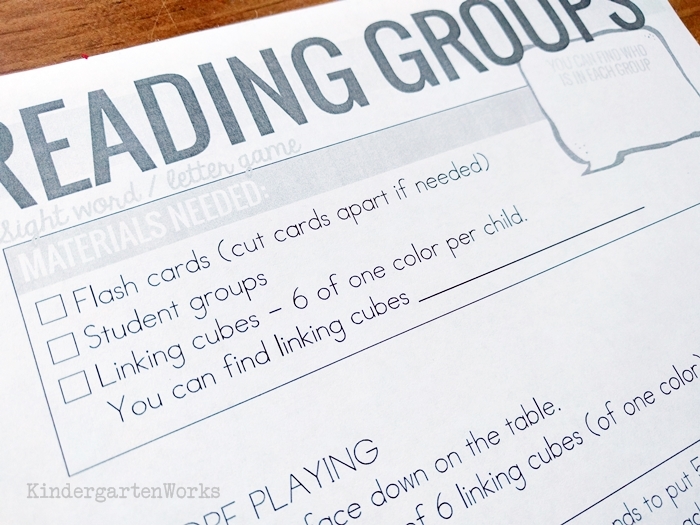 Choose the blank page and print off enough for your class. 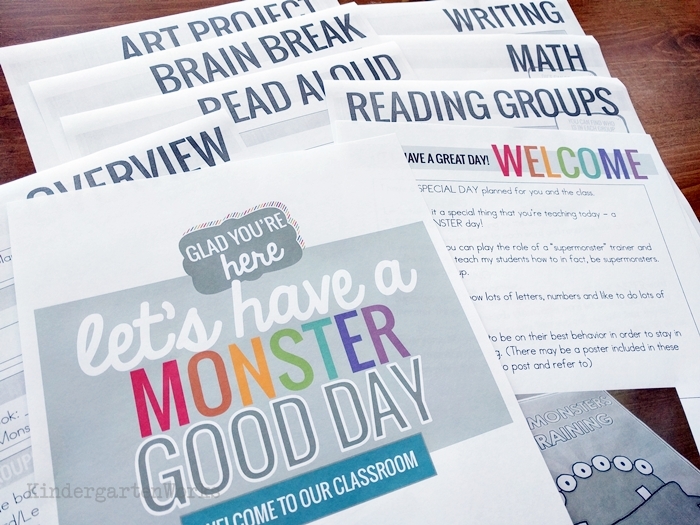 Students could write their opinion of monsters or respond to the read aloud story. Another option: have kinders write about where they’d live if they were a monster. Simply jot down your prompt onto your sub’s overview page and you’re set to go! If you think there is potential that you may be gone for 2 days, then insert this art project into your lesson plan stash. 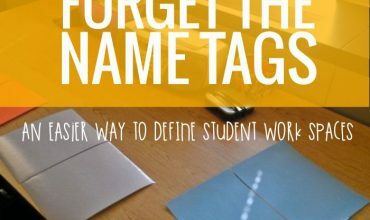 Have your students add a sentence with word cards to their completed piece. 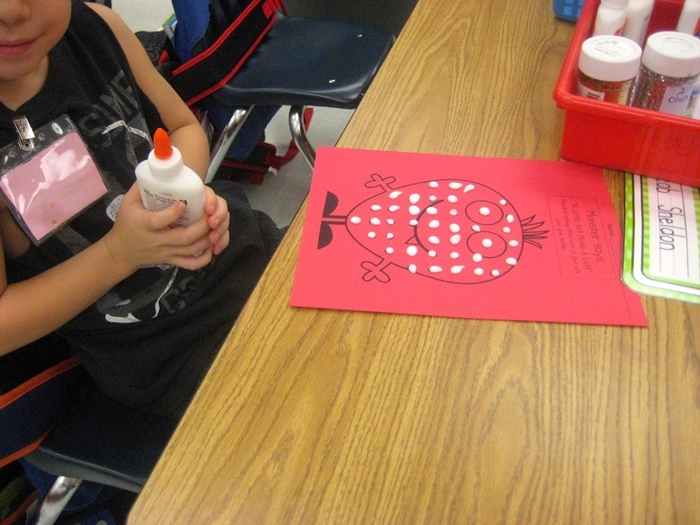 Ask your sub to prep the art pieces for you (for the second day or say for after a prep period) and leave a copy of the words for them to make copies for your class. I’d recommend breaking this project up into two parts/times of the day. 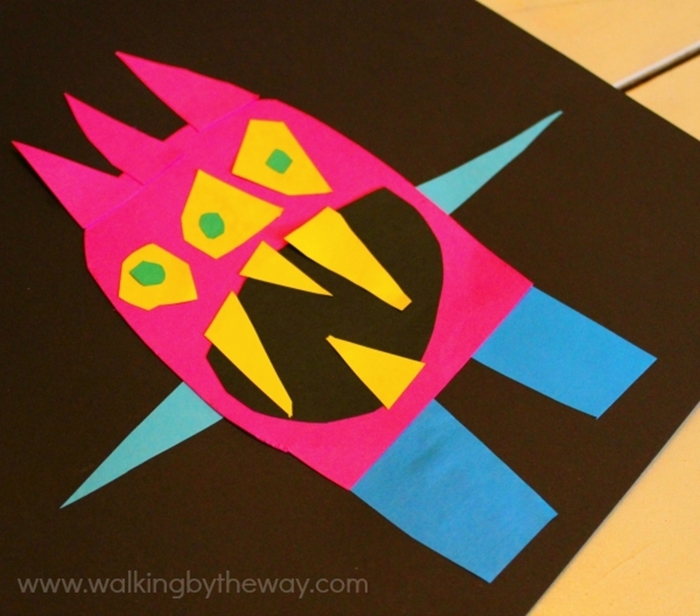 Students make a construction paper monster. They cut apart and reassemble an “I like the (color) monster” sentence. If your class has some cutting skills, you could totally just have them make a body with construction paper and then color and add these monster body parts. 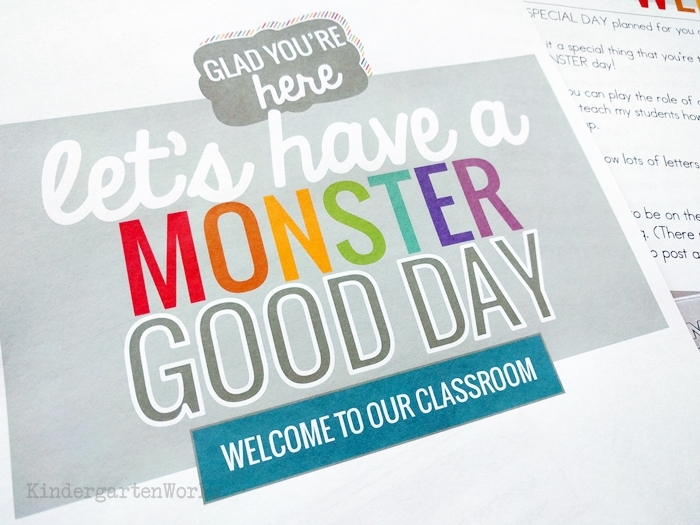 A simpler alternative is to use this free learning how to glue monster template. Your sub could use glitter or potentially tissue paper squares or construction paper squares if you want to go beyond just gluing practice. Glue, stick on, done! 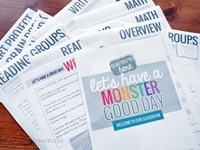 One more alternative gluing practice worksheet (in a star shape) with a monster on it – print page 3. I hope this can truly save you time when you’re in a pinch. Get your emergency sub plans for kindergarten below. Here’s how I liked to lay everything out for a sub in my classroom. Do you have more packets like this for sub plans for sale somewhere? I am very interested! I don’t have anymore actual sub plans for sale. 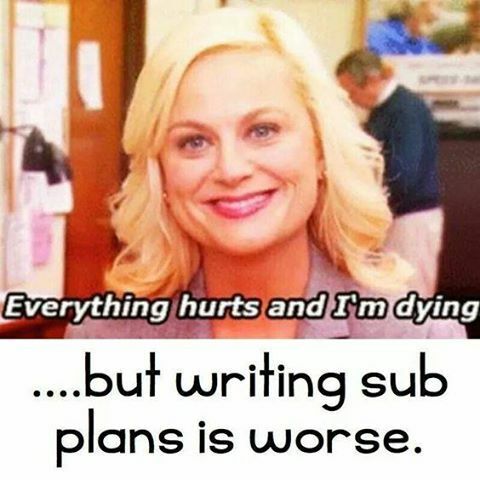 Just an organizer and a template for making your own sub plans available here: https://www.teacherspayteachers.com/Product/Substitute-Survival-and-Thrive-al-Packet-328927.